I’d really like to go and see Dunkirk today. I haven’t been to the movies in a long time and, to be honest, I haven’t really been bothered about that either. These days, I rent my movies via a little Apple TV thingie, close the curtains and do my own cinema thing without the crunching popcorn and the incessant chatting (yes, I’m getting old and grumpy). But Dunkirk, yes I’d like to go see this one. I’ve been trying to persuade Sam to come along with me but he seems to share my feelings about the cinema now. I told him how it was a Christopher Nolan film and reminded him that we’ve seen all of his since way back when. So maybe he’ll relent and tag along with me. Maybe I’ll go on my own, it certainly wouldn’t be the first time. Why Dunkirk, though? Why the particular interest there? Well, it sounds good, doesn’t it? 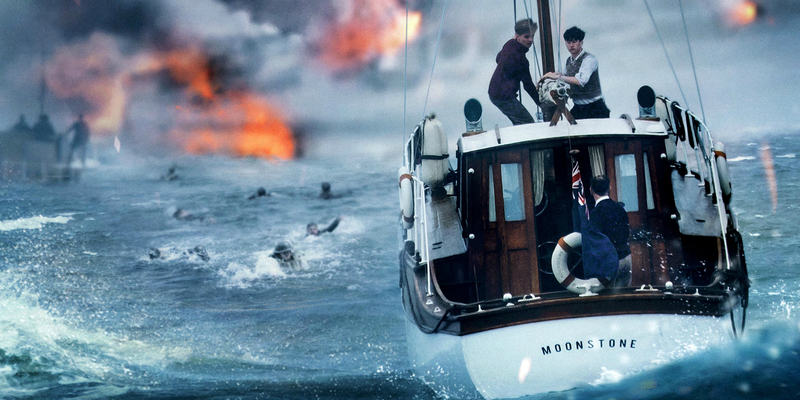 The story of Dunkirk (for me) is one of ordinary people being completely heroic, setting off into the unknown, unprepared, in a desperate attempt to rescue their people. It looks good too, if the bits I have seen are anything to go by. There are quite a few reasons why I’d like to go see this one. But, if I’m honest, it’s mostly the boats. I seem to have a weakness for movies with boats in them or movies set on boats. I think I always have. Even when I was young, old flicks like ‘Mutiny on the Bounty’ or ‘Captains Courageous’ always seemed to capture my imagination. 'Jaws' probably sealed the deal when I was twelve. It’s my favourite movie (I think) and I’ve written enough about it in other posts so I won’t go into it again here but it was the ‘men on a boat’ part that finally won me over I think. Last year's 'Swallows and Amazons' also won me over completely... there were boats in it. There’s two aspects to it, I think. I’ve partially forgotten that my childhood played itself out in the company of boats. We lived right beside the river and I was often to be found out there in an eighteen foot rowboat, heading for the lake and the islands or else just loitering at the edge of the bullrushes, lazily trying to nab a perch or a pike. I think it gets into your spirit a bit. The lapping of the water on the bow, the oars cutting through the still surface, the deep spiralling eddies the blade leaves behind. Stuff like that. Perhaps, when you’re not on the water any more, it sparks something in memory to at least see other people there, even if it's only up on a screen. Perhaps that’s it. Of course, Dad was a man of boats too and he loved a good boat movie as well. That probably played a sizeable part in influencing me. It was said that he went to see ‘The African Queen’ every night for the seven nights it played in our local cinema. Whenever a boat movie would come on the telly, he would sit forward a little and announce to the room ‘this is a good movie.’ He let me sit up to see ‘A Night to Remember’ when I was probably too young for it. I’d watch it again right now, if it was on. There was one boat movie he didn’t care to see and he shares this with my wife, Patricia, who cheerfully reckons it is the very worst movie we ever went to see. ‘A Perfect Storm’. I didn’t mind it so much. It had men in boats in it and that ticks enough boxes for me to generally see me through. I remember talking to Dad, saying ‘you should go and see this one’. I remember him looking surprisingly sad and saying to me, ‘no, I don’t really care for films like that’. That was a puzzle. I didn’t quiz him more about it but I sometimes think about it. It was a boat movie, after all, and there was fishing and drama and camaraderie before things turned bad. Why did he not care for this type of film and what type of film was that anyway? I can only assume it was because people drowned in the film. I can only guess that this was the reason why he didn’t care to see it. But that doesn’t quite fit. When has there been a boat movie where people have not drowned? Titanic and such didn’t seem to trouble him. So why this one? I’ve thought about it and I think I know. I think it was because we got to know the characters who drowned before it happened. Like the film or hate it, we knew the characters well before the water came to claim them. I think that’s what it was. Dad had known people who had gone to the water and never come back. Perhaps that particular movie was too close to the heart. Anyway, I think I’ll see if somebody might bring this old sod to see Dunkirk. Maybe Patricia might take pity on me, thought she’s largely spoilt for boat movies after Clooney and Co.
It’s not so much that I’m looking for an afternoon out or that I crave popcorn or dark enclosed spaces on this nice July day. It’s just that, well, it’s a boat movie and you know how I’m a sucker for them. My dad was in the navy. During the war I mean. It did not instil in him any great passion for ships or boats and the only time I was ever on a ship with him was the ferry to Dunoon a few times. He never took me boating. I only have two recollections of being in a boat and on both occasions I was terrified because I found myself in the company of irresponsible individuals. No, I do not like being on the water and I’m not that fond of being in in water; I was about thirteen before I learned to swim and even now I can only do the breast stroke. I, too, grew up around various bodies of water and my childhood was spent wandering around ponds or rivers or down the shore. I never minded being close to the water but I was always acutely aware of how dangerous it was so although we made plans to construct a raft to go out into the frog pond we never did. I’ve not read much about Dunkirk. It doesn’t call out to me but I’d like to hear Zimmer’s score; I’ve read good things. I don’t avoid war films per se and will’ve seen all the classics that were ever shown on TV during my childhood and enjoyed them mostly—I bet I’ve seen The Bridge on the River Kwai four times—but I don’t seek them out nowadays. The last I can remember deliberately watching was Clint Eastwood’s Flags of Our Fathers and I fully intended watching its companion piece, Letters from Iwo Jima but, to date, I’ve never got round to it. It’s been years since I went to see a film at the pictures. If I remember correctly it was Star Trek Into Darkness but it might’ve been Star Trek in 2009; that’s feels about right. I don’t miss it. I think there were two of us in the auditorium that day so no rustling papers or noisy kids or anything which was nice but with the dirty great flat screen we have right now (43" I believe but really don’t care) it’s as good as being at the pictures with all the benefits of home, i.e. a pause button.